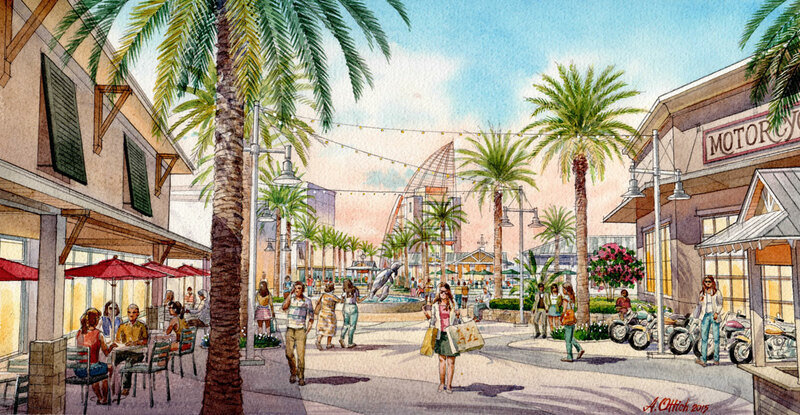 WFTV Orlando is reporting Sooner Investment Group Inc signed paperwork to terminate their agreement with Port Canaveral to develop the expansion project, The Cove. In August 2015, Port Canaveral commissioners approved a development agreement with Sooner Investment and Collett on initial development of 80,000 square feet of retail, restaurant, entertainment and service uses plus a secondary 10,000 sq ft module. The agreement permitted Sooner Investment to begin signing letters of intent with businesses interested in being inaugural tenants. Plans for The Cove area promised to bring a mix of retailers, restaurants, service businesses, entertainment venues and a full service upscale hotel with at least 150 rooms to the port area to serve port cruise passengers, day visitors as well as area residents. Over the last few years cruise lines including, Disney Cruise Line, have increased daily port call visits giving cruise passengers embarking from another home port an opportunity to explore Florida’s Space Coast or theme parks in the Orlando area. The Cove would have provided a nearby shopping experience for cruise passengers and crew. Originally, construction on the initial 52,000-square-foot Cove development area was going to begin in June and and last almost 18 months with an additional 18,000 square feet completed my the summer of 2017. A representative for the developer, Jason Steele, noted the biggest problem was timing set by the port resulted in the inability to secure tenants. According to a report from Florida Today, potential retailers were concerned about the potential customer numbers at a cruise port. Sooner missed a March 17th deadline with the port which was to include among other items, letters of intent for 21,000 square feet of Phase I space. Port Commissioners pulled an agenda item from the March 23rd meeting to allow for more time to discuss the issues with Sooner. The mutual termination agreement executed by Sooner Investment Group has NOT been signed by Port Canaveral. This will more than likely be an agenda item a the next Port Canaveral commissioner meeting which is scheduled for 9 AM on April 27, 2016. This entry was posted in News and tagged Port Canaveral by Scott Sanders. Bookmark the permalink. The only way I see that area attracting cruisers is if there was luggage check in, rental car return and shuttle to the cruise ship. This would have been great when we took a Cruise out of Port Canaveral and arrived a day early. There wasn’t much to do the day before (arrived in the afternoon, not enough time to hit the Cape) but having a downtown area to walk to for dinner and just wander around would have been terrific. You’d think there would be enough foot traffic with several ships to keep things going. You just need to learn the travel patterns. Like if there’s no cruise for 4 days, you limit your hours or staff, but the day before a ship leaves (Especially if two are leaving) you ramp up your staff.